I don't usually make sewing plans, I'm more see pretty fabric, see pretty pattern, buy, sew, or all too frequently buy add to stash. That's not to say I don't make lists, I just don't usually do very much with them. I don't know about anybody else, but I was very tempted by the Sewing Indie Month Pattern Bundle 1, ten lovely patterns at a nock down price, plus the bonus of to donating to charity, all very tempting. But on this occasion I did not succumb to temptation (probably because I know I'm going to be more tempted by Pattern Bundle 2). There are ten great patterns here, but would I actually make and wear them? For the majority of them, the answer is actually no, and that's not to say they are not fine patterns, just not for me. I am tempted to buy the Saltbox Top from Blueprints for Sewing, and I already own the Melissa Dress from Muse patterns, but the other pattern would have sat on my hard drive, not being sewn, and that shouldn't be the fate for any pattern. 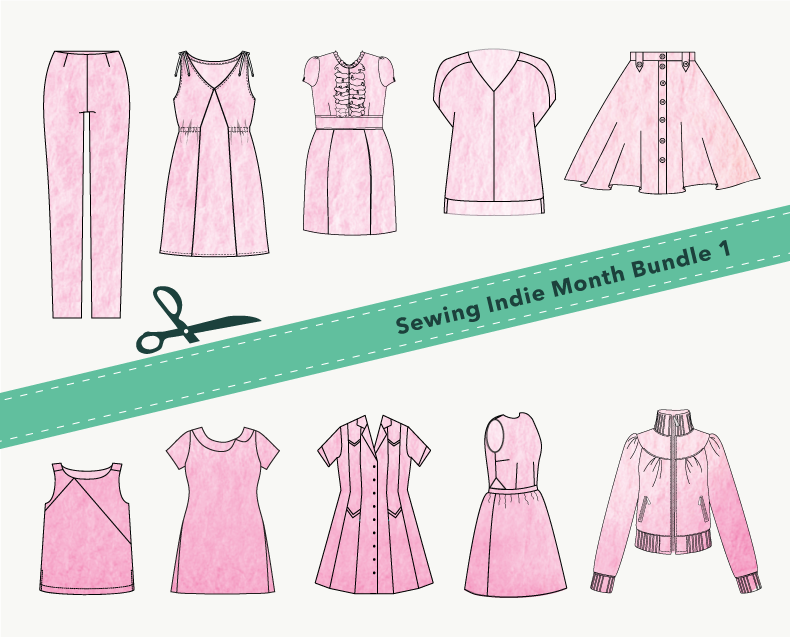 I currently have 25 Indie patterns that I already own, but have yet to sew, go check your own hard drive and see how many impulse pdf purchases you have, I can't be the only one to give into temptation, can I? The biggest piece of fabric in the bunch is this red/blue/beige/green check, as I have about 2 metres. I was tempted to make some kind on pinafore dress, but then realised that I am 45 not 5 years old and I'm going to try and adapt the Onyx top into a dress. The green and pink retro print I think may become a Brumby skirt, so that it can be toned down with plain tops. Will any of these things get made? Some of them probably, all of them, probably not. Come back to find out. So we actually took these photos on August the 5th, but life has a habit it getting in the way of the best laid plans. As I set myself this sewing challenge to tie in with the Tour de France, I felt I should finally do this post as the next big cycling grand tour la Vuelta Espana starts tomorrow. I did say at the start that I wasn't going to put any unreasonable deadline on myself, but this may be cutting it a little fine. So here is my Sky Skirt, because of course Chris Froome of Team Sky won the Tour de France this year for the second time. If you don't know, the Team Sky strip is black with a turquoise stripe down it, but as I don't wear a lot of black (because of a very blonde dog who likes cuddles), I made the skirt turquoise with a black stripe. Undeniably the most interesting feature of this skirt is the back zipper﻿. It uses an open ended zipper, so you can make the back slit as high a you dare. As you can see I don't really dare. This is the second time I have made this skirt, the first was for the New to Me challenge during Indie Sew Month, over at The Monthly Stitch. Blogged about here. After the oh so clingy nature of my first version, I decided to line this one. I don't think I completely followed the instructions, as my comprehension of French is still rather poor, but I think it turned out fine. Once again I added pockets, I've got to have pockets. The turquoise fabric is from Direct Fabric Warehouse and was £5.99 a metre. The fabric is 100% Linen, hence all the wrinkles. I didn't really need a whole metre, but they only sell fabric in 50cm increments and 50cm was not quite enough. I also bought some black polyester lining there. So I now have a 40cm remnant of turquoise linen and black polyester, needing to be used. The zip was from a haul of haberdashery a got at a charity shop in Buxton several years ago. The black fabric was salvaged from a pair of trousers, purchased at a charity shop, that I obviously used one leg for another project many moons ago. It is a Linen/Ramine mix, so washing these fabric together for the first time could be fun. I'm a rebel, I very seldom prewash my fabric. I really like this skirt, but I don't know who often it will get worn, as I just don't have many tops that go with it. Maybe I will get around to finally changing the buttons on the black linen blouse I made over a decade ago and I can wear them together and be all kind of wrinkly. I do seem to have an addiction to making skirts, the way some bloggers are addicted to making dresses. Maybe I need to focus more on making tops, so that I have something to wear with my many many handmade skirts?